Our Banded Leather Cuirass has an awesome look to it. You can order it with contrasting colors or all one color. 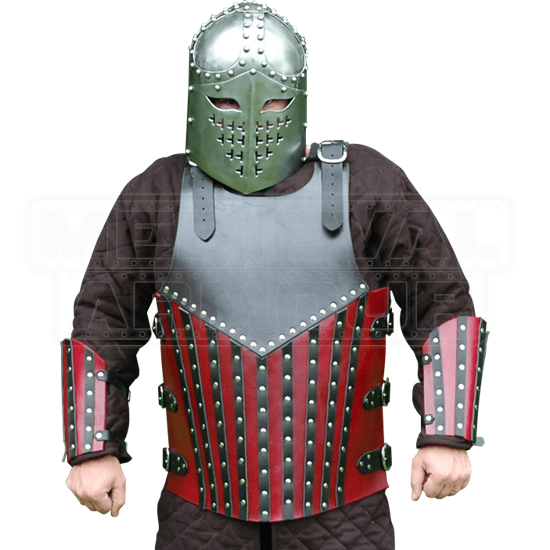 Our Banded Leather Cuirass is made up of a breastplate and a backplate. The design is the same on each side, except the breastplate has a lower neckline for proper fitting. The upper part of the armour (shown in black) is made from 13/15 oz. leather. The lower part of the armour is made from 7/8 ounce leather and has bands of 7/8 ounce leather riveted on top. This armour provides great protection without limiting your range of motion. Matching arm bracers and greaves are available separately for a complete look. When selecting your colors, the Color selection is for the lower main part of the armour (shown in red). The Accent Color selection is for the bands and chest (shown in black). The armour in the main picture is shown in Red with Black bands. When picking colors keep in mind that the band color will match the color of the top of the armour. For example, if you order Black with Green accents, the bands and chest/upper back piece will be green and the lower background part of the torso would be black. The armour has three straps and buckles on each side, and also buckles on the shoulders.